McLaren’s Lewis Hamilton achieved his life-long ambition by winning the Monaco Grand Prix in a thrilling race in tricky weather conditions. He survived a brush against the Armco barrier on lap five exiting the Tabac corner and went on to take an all-important win. Hamilton’s second victory of the season (the sixth in his Grand Prix career) came at the perfect time to take the championship lead. Robert Kubica beat pole-sitter Felipe Massa in the rain-affected race with second position thanks to pitting onto the groove (dry slicks) Bridgestone at the right time. Despite locking out the front row, the Ferraris made the wrong strategy call in the race and suffered the consequences. This was especially true for world champion Kimi Raikkonen, who was given a drive-through penalty for making his tyre decision at the start of the race too late… and then crashing his F2008 against other cars. The collision meant Mark Webber (for Red Bull) and Sebastian Vettel (in the sister team that of Toro Rosso) to complete the top five. Honda’s Rubens Barrichello profited from all the incidents in this dramatic Monaco Grand Prix with a fine sixth – bringing an end to his nightmare 22 race points drought which stretched back to the 2006 Brazilian Grand Prix. Kazuki Nakajima kept out of trouble to finish seventh for Williams (competing in the team’s 600th Grand Prix), while Heikki Kovalainen managed to score the final point despite stalling his McLaren on the parade lap. Before the race even began, several drivers were concerned about the weather conditions. Without traction control, it was extremely difficult to stay on the track. Even though the rain is a great variety in levelling out the playing field – by which the mid-field teams can score big – it was still a challenge for all the Formula One drivers to control over 700 brake horsepower around a twisty and narrow street circuit. So making the right call in starting on which Bridgestone was the key question. With three minutes before the start of the race, the drivers and teams made the decision to start on intermediates. But unfortunately, Raikkonen made the choice too late and was given a drive-through penalty for this mistake. As the red five lights flicked off, Hamilton made a clean getaway from third on the grid to move ahead of Raikkonen as the cars heading into Saint Devote. 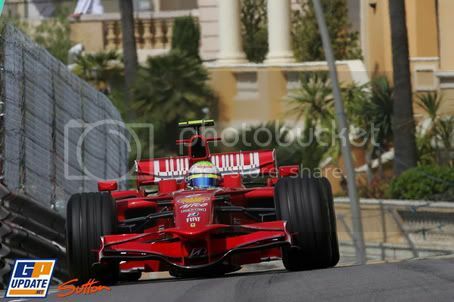 Leading from the front was Massa and at this early stage of the race, the Brazilian was the quickest. On lap five while running second, Lewis made an error on approaching the Swimming Pool complex. The McLaren went into oversteer and he brush the Armco barrier with his right-rear tyre. This resulted in a puncture for Lewis but luckily he made it back to pits and was able to continue (without losing too many positions). During this pit stop to replace the damage Bridgestone, the McLaren mechanics decided to switch strategy and fuelled Hamilton’s car with more fuel. This gave the advantage to them over Ferrari in the outcome of the race. The safety car made its first appearance on lap seven after a series of incidents at Casino Square. First double world champion Fernando Alonso tagged the wall and – like Hamilton – destroyed his rear-right tyre but he managed to make it back to the pits and continue. Moments later, David Coulthard (in the Red Bull) slid into the same barrier, and was then collected mid-crash by Sebastien Bourdais (in the sister Toro Rosso), who was having an accident of his own! Both cars were out on the spot. Alonso took the opportunity to switch to the extreme wets during his stop for repairs and that gave him that extra pace to challenge the other cars when the race resumed following three laps under the safety car. Unfortunately, his charge with a better-spec wet tyre resulted in him tangling into BMW’s Nick Heidfeld in the Hotel Hairpin (formerly known as Loews), breaking his Renault’s front wing and forcing Heidfeld to pit with a puncture. Nico Rosberg also lost his wing in an incident with Kovalainen in a traffic jam behind the interlocking BMW and Renault in the tight hairpin. At this point, a message flashed on to the timing screens from Formula One Management (FOM) that car number one (Kimi Raikkonen) will need to serve a drive-through penalty. The Iceman took this after the restart – losing him time and position – but he would lose even more when he missed his braking point at Sainte Devote breaking his front wing. Initially the McLaren driver was dropping away from the pair due to running with a heavy fuel load, but as his car lightened and the track began to dry out, Lewis was setting purple sectors. He was lapping between one and three seconds faster than Massa during the middle part of the race. By the time Hamilton made his final pit stop and took on dry groove Bridgestone on lap 53, his lead over second-place was nearly 40 seconds. He had no problems rejoining the race up front. The expected second phase of the rain shower didn’t arrive and McLaren made the right call to bring in Hamilton with the correct tyre selection. Robert Kubica also benefitted by switching to ‘slicks’ and gained a place over Felipe Massa. Ferrari made a mistake by delaying the decision to switch to groove tyres for Massa and this ultimately cost them the race. Behind Hamilton, Kubica and Massa was Adrian Sutil in the Force India. The German was driving a beautiful clean race and gained an advantage when the team chose the perfect moment to change onto the dry tyres. This allowed Sutil to take fourth from Mark Webber who made his tyre call a fraction too soon in the semi-dry track conditions. Sutil was enjoying the moment battling against world champion Raikkonen and the Red Bull of Webber until Nico Rosberg had a huge crash on the entry to the Swimming Pool section on lap 61 – prompting a second safety car. This was bad news for Lewis Hamilton. After comfortably stretching his lead to around 40 seconds, the safety car wiped out that time advantage and now Kubica was on his tail. As the race resume with only eleven and a half minutes to go (the race was approaching its two-hour limit), Raikkonen made a silly error in his determination to get past Sutil on the restart. It seems Kimi lost control under braking on his approach to the sea front chicane. The Finn tried to lose some speed but he couldn’t slow down… Kimi ploughed into the rear of the Force India causing terminal damage to Sutil and ending all hopes for the team and the German. Raikkonen was able to continue but that incident cost him the championship lead. Ninth position was a disappointing result for the Iceman after a frustrating race. As the chequered flag fell on the two-hour mark, Lewis Hamilton crossed over the finish line feeling overjoyed. It had been a fantastic drive from the McLaren star and crucially it came at the time after four dominant races from rival Ferrari. Robert Kubica finished in an excellent second position without making any mistakes in the wet-dry race. 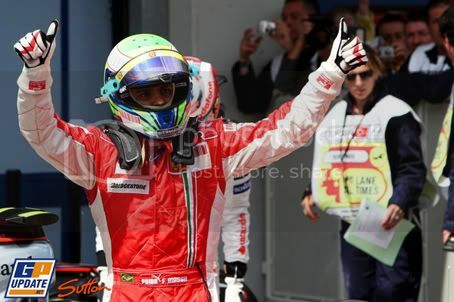 Felipe Massa came home in third and even though he started on pole position, it wasn’t a good result for Scuderia. At least Massa should be satisfied to out-perform his team-mate and he is now only a single point behind Raikkonen in the championship standings. Mark Webber benefitted from the Raikkonen/Sutil incident to take fourth ahead of Sebastian Vettel, who finally scored a result for the new Toro Rosso STR3. Rubens Barrichello finished in sixth ahead of Kazuki Nakajima’s Williams and Heikki Kovalainen in the McLaren. Behind Raikkonen, Fernando Alonso was tenth for Renault after a series of collisions, followed by Jenson Button, who lost his Honda’s front wing on the opening lap in a brush with Nick Heidfeld. The Toyotas of the three-time spinning Timo Glock(!) and Jarno Trulli came home in P12 and P13 while the last remaining runner was Heidfeld. Non-finishes were Sutil, Rosberg, Coulthard and Bourdais with Nelson Piquet joining the list of retirements after dropping out of a tough fight with Vettel after brushing a wall. Force India’s Giancarlo Fisichella also recorded a DNF in his 200th Grand Prix. The result of this thrilling race puts Hamilton back in the championship lead with 38 points to Raikkonen’s 35, Massa’s 34 and Kubica’s 32. In the constructors’ standings, Ferrari have 69 to McLaren’s 53 and BMW Sauber’s 52. The battle for the world championship has suddenly come alive again as Formula One heads over the Atlantic to Canada in a fortnight’s time. Ferrari arrived at Monte Carlo hoping for a much better showing than they managed last season when the McLarens ran rings around them with a perfect 1-2 result. Fast-forward twelve months on, not only have Scuderia improved on form with a quick and reliable car, but Felipe Massa and Kimi Raikkonen locked out the front row of the grid even though the McLarens were the pre-race favourite. Indeed, Lewis Hamilton was the fastest driver around the streets of the Principality after setting the pace in the Mercedes-powered MP4-23 during opening practice on Thursday. You would expect the team and driver to continue this impressive form into the all-important qualifying session, but it seems their Italian rival have something up its sleeve in terms of outright performance. With Felipe Massa scoring his third pole position of the season with a lap time of one minute, 15.787 seconds around the tight, twisty and challenging street circuit, it will be fascinating whether McLaren can fight back. World champion Kimi Raikkonen is alongside his team-mate with second position giving Ferrari its first front row start since 1979. By starting at the front, Ferrari will have the advantage in strategy and hopefully can end that winless streak at Monaco after six difficult years. Championship challenger Lewis Hamilton was disappointed and shocked to only qualify in third. The McLaren driver admitted later on that he was losing time to the red cars in the middle sector of the lap, but he remains optimistic for the race ahead. His team-mate Heikki Kovalainen was only two-tenths of a second slower and will start the race in fourth. Behind the two top teams in Formula One, Robert Kubica took his customary fifth position for BMW Sauber while Nico Rosberg carried his excellent practice form into qualifying with sixth for Williams. The British squad is celebrating its 600th Grand Prix and team boss Sir Frank Williams is hoping Rosberg can score some championship points in Sunday’s Grand Prix. Double world champion and two-time Monaco winner Fernando Alonso lines up in seventh for Renault despite a lack of speed and rear-end grip in the R28. Toyota’s Jarno Trulli will start in eighth ahead of the Red Bull pair of Mark Webber and David Coulthard – ninth and tenth respectively. In Coulthard’s case, the Scot was unable to take part in the top-ten shootout for pole position after losing control of his car under braking at the sea front chicane. The Red Bull locked its rear brakes over a crest in the road and the car pitched right into the Armco and DC became a passenger as the car went out of control down an escape room… Luckily he was unhurt but the Red Bull RB4 suffered heavy damage. Several drivers’ last efforts in Q2 were affected when Coulthard struck the barrier. That left Nick Heidfeld down in P13 (his worst for 2008), both Hondas (Jenson Button and Rubens Barrichello, though the latter is under investigation by the race stewards for blocking one of Giancarlo Fisichella’s laps in Q1), Kazuki Nakajima, and Timo Glock. Nelson Piquet continued to struggle in qualifying after being knocked out in Q1. The Brazilian is under pressure to perform and it didn’t help that he nearly damaged his car when exiting Portier during his fast lap… He will line up 17th on the grid. Both of Scuderia Toro Rosso’s new cars were also knocked out in the first round. Champ Car star Sebastien Bourdais was unlucky not to make it through, with his last lap just half a tenth slower than Kazuki Nakajima in 15th. Team-mate Sebastian Vettle was one-tenth slower and is in P18. Sunday’s Monaco Grand Prix will be an interesting contest between the top four drivers in Formula One. Felipe Massa might not be a fan of this street circuit but he will have the advantage of having a clear track in front of him. If the Brazilian wins, he will significantly reduce the points gap to world champion Kimi Raikkonen in the drivers’ standings. For Raikkonen, the Finn has to challenge his team-mate for the race victory in order to sustain his championship lead. As for Lewis Hamilton, he wants that ‘dream result’ by winning for the team while McLaren team-mate Heikki Kovalainen is hoping that he has an opportunity to score that elusive first victory after a set-back race in Turkey. There is a possibility of rain heading to Monte Carlo on Sunday and it should be a dramatic race if the heavens open… Without traction control, it will be a challenging task for the 20 drivers to control 700 brake horsepower around a twisting street circuit for 78 laps… Let’s see what happens on race day! 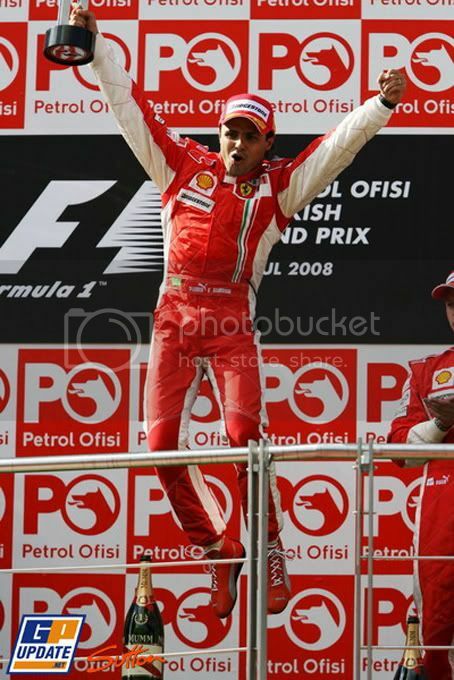 Felipe Massa once again proved unbeatable at the Istanbul Park circuit with a commanding drive in the winning Ferrari F2008. The Brazilian’s second win of the season places him in striking distance in the world championship honours. 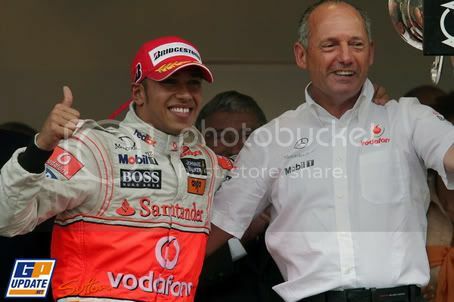 McLaren’s Lewis Hamilton finished in an excellent second position after driving an aggressive race by running a three-stop strategy. Even though Lewis overtook the race leader Massa on the 24th lap with a brilliant overtaking move, the extra pit stop cost him that race win… But at least the McLaren driver should be satisfied with the result, especially beating the second Ferrari of Kimi Raikkonen. The Finn recovered from a bad start to finish in a close third but his points lead in the drivers’ standing is now reduced to seven points after team-mate Massa latest victory. As for his fellow countrymen, Heikki Kovalainen suffered a left-rear puncture (possibly caused by Kimi’s front wing endplate piercing his Bridgestone tyre at Turn 1) that resulted him dropping down the field. Heikki did well to recover with some spectacular overtaking manoeuvres but in the end finished a lapped 12th. The BMW Sauber pair of Robert Kubica and Nick Heidfeld finished the 58-lap race in fourth and fifth respectively, though the lack of pace was a worry. That elusive first win for the German/Swiss manufacturer will come another day. Double world champion Fernando Alonso came home in a solid sixth place for Renault, casting aside the disappointment from the previous race in Barcelona. Seventh went to Mark Webber for Red Bull Racing with Nico Rosberg taking the final point finish with eighth for Williams. Finishing in ninth was David Coulthard in the second Red Bull and Toyota’s Jarno Trulli was the last unlapped runner with tenth. Honda’s Jenson Button had a difficult race to 11th position while his team-mate Rubens Barrichello – whose 257th Grand Prix outing did not produce anything to shout about – came home in a disappointing P14. Between the Honda pair was Kovalainen and Timo Glock’s Toyota. Nelson Piquet’s poor qualifying performance left him 15th, with Adrian Sutil (Force India) and Sebastian Vettel (Toro Rosso) completing the finishers. The latter duo both stopped at the end of the first lap to have repairs made after Giancarlo Fisichella’s unhappy weekend came to an end as he tried to pass Kazuki Nakajima – by flying over the top of the Williams! Neither the Italian, nor the Japanese (who got to the pits minus his rear wing) were able to continue. The other retiree was Sebastien Bourdais, who lost control of his Toro Rosso after it developed a mechanical problem at the rear of the car as he was braking… The former Champ Car champion was out after sliding into the gravel trap. The 2008 Turkish Grand Prix result leaves Raikkonen with a diminished lead in the world championship chase with 35 points, ahead of Massa and Hamilton on 28 and Kubica on 24. Ferrari extends their advantage atop the constructor standings, heading BMW Sauber by 19 points, with McLaren a further two adrift. The next race is the glamorous Monaco Grand Prix on the streets of the Principality. Can McLaren stop Ferrari on its winning run? Let’s find out in a fortnight’s time. Ferrari’s Felipe Massa achieved his third successive pole position after a dominant performance in qualifying at Istanbul Park. The Brazilian, who is chasing a third straight victory on his favourite circuit, was comfortable the quickest driver on the challenging Hermann Tilke-designed race track. His time of one minute, 27.617 seconds was two-tenths of a second faster than the McLaren of Heikki Kovalainen – who bounced back in style after his big crash in last month’s Spanish Grand Prix. Kovalainen’s car seemed to have a better balance over his team-mate Lewis Hamilton. The British driver was struggling with his Bridgestone and was disappointed that he could only set the third quickest time after making a bad choice over the hard compound tyres… But at least he will start the race ahead of the world champion, Kimi Raikkonen. The Iceman couldn’t match the pace compare to his Scuderia team-mate, but the differences could be down to different fuel load. Is Kimi running a longer first stint in the race? We shall see. Robert Kubica lines up fifth on the grid for BMW Sauber with Mark Webber alongside him. It was a good result for the Australian after he damaged his Red Bull Racing against the Armco barrier during the practice session on Friday. Double world champion Fernando Alonso is in seventh position for Renault ahead of Jarno Trulli’s Toyota and birthday boy Nick Heidfeld in the second BMW Sauber. Rounding up the top ten is David Coulthard, who chose to save fuel and only did one qualifying run in Q3. With the demise of Super Aguri, the qualifying format was tweaked to a new format with the five slowest cars dropping out in Q1 and Q2. This made life difficult especially for Kazuki Nakajima’s Williams and Nelson Piquet in the Renault. The Japanese went into a spin exiting Turn 7 on his first Q1 run while the Brazilian was knocked out as the others improved in the final seconds of the session. As for Giancarlo Fisichella, even though the Italian out-qualified his Force India team-mate Adrian Sutil by half a second, he will start behind the German thanks to his penalty for passing the pit exit red light at the start of Friday practice. It will be a tough race for Fisichella started from the back. But all interest will be at the front. Can Felipe score his third successive win at the Turkish Grand Prix? Can the two McLarens find a way to prevent this and what about Raikkonen? Does the Finn have the speed to challenge for the win? Bring on race day!